Stunning, custom atrium ranch on a breathtaking 3+ acres w/ tons of privacy. Like new on interior w/ quality finishes throughout & loaded w/ updates; newer carpeting, wood floors & freshly painted! 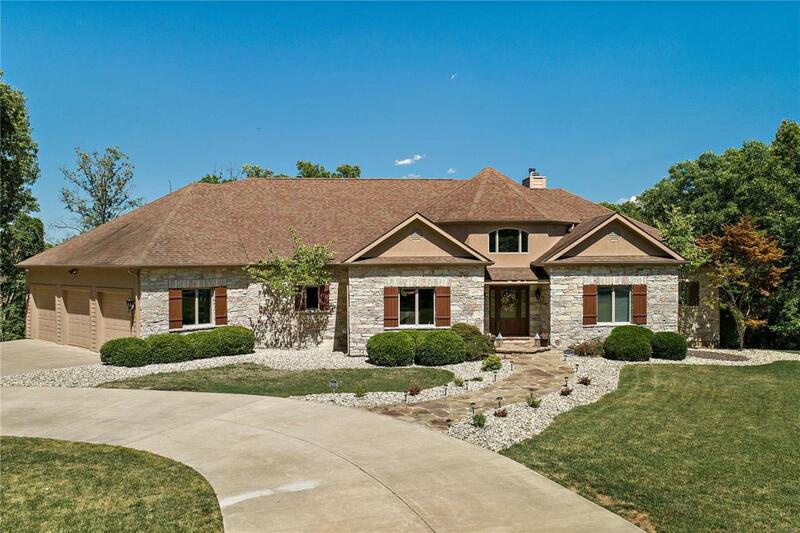 2 sty foyer opens to great rm w/ a wall of windows, vaulted ceiling & fireplace. Dining rm w/ coffered ceiling & arched opening. Gourmet kitchen w/ granite countertops, custom backsplash, center island, planning desk, wi pantry & adjoining breakfast rm. The hearth rm is a perfect place to unwind w/ a walk-behind wet bar, fireplace & 2 French doors to the deck. ML mstr suite w/ lux bath boasting double vanities, jacuzzi tub & custom shower. Addtl bedrm & full bath on ML. Finished W/O LL w/ a family rm w/ fireplace, full kitchen, 3 bedrms, full bath & doors to the patio to enjoy the ingr. salt water pool - perfect as an in-law quarters. Addtl features: Built-in speakers, ML laundry, blown in insulation, 8" baseboards & 8' solid core panel doors, finished 3 car garage & more! Move-in ready!